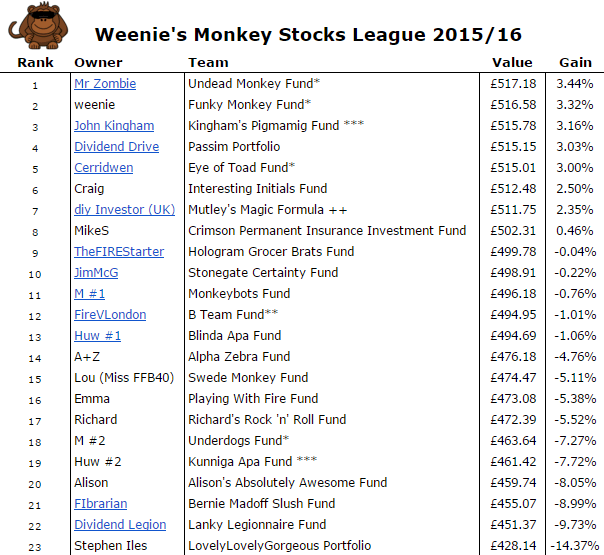 It’s Month 3 of the Monkey Stocks League Challenge, so who finished top of the charts in 2015? 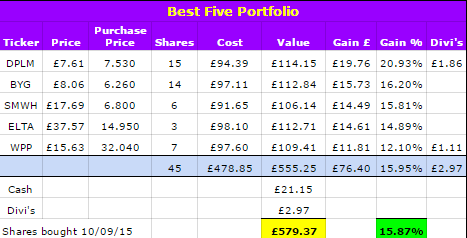 Below is a snapshot as at the close of trading 31st December 2015 and in the lead was the Undead Monkey Fund! All December dividends have been added to the respective portfolios. However, please let me know if I’ve missed any (or if there are any errors) as there are so many to keep track of. Three of the real portfolios (Undead, Funky and Eye of Toad) continue to do well, with the B Team just outside the top 10, but the Underdogs are languishing lower in the table, still suffering from the loss in share prices of Standard Chartered and Glencore. John Kingham’s Pigmamig Fund is challenging the monkeys at the top, whereas Huw’s Kunniga Apa Fund isn’t faring so well in 19th place. The best 5 performing shares since the start of the league are Diploma plc, Big Yellow Group plc, WH Smith plc, Electra Private Equity plc and WPP Plc. The worst 5 performing shares are Morgan Advanced Materials plc, Hunting plc, BBA Aviation plc, Pearson plc and Poundland Group plc. 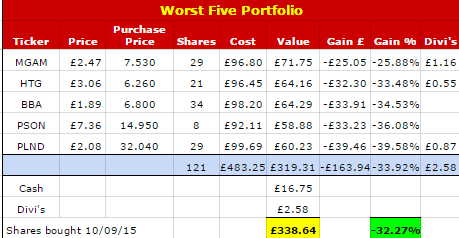 If you’d had the misfortune to pick this lot, you’d be sitting on a loss of -32.27%! It’ll be interesting to see what effect the mooted ‘bear market’ of 2016 will have on this challenge! Haha, well done Mr Z but that trophy aint in your grubby little undead mitts just yet! Haha, still early days yet Huw and who knows what the markets will be like this year – a few days into 2016 and they’re already all over the place!